If you’re like most patients in the Calgary NW community we see today, you’ve suffered from back, hip, leg or neck pain for far too long–maybe decades. You may have tried virtually everything–bed rest, over-the-counter medications, prescription pain killers, physiotherapy, injections, acupuncture, traction and maybe chiropractic or even surgery. So far, nothing has worked. You’re still in pain. Spinal Decompression has a high success rate for decreasing or even eliminating pain associated with herniated or bulging discs. Fact is, most back and neck pain is caused by herniated discs, bulging discs or degenerative discs. This leads to sciatica, back pain, leg cramps, neck pain, arm pain, and a host of other symptoms. The problem has always been finding a way to treat discs without doing something invasive like surgery. Prior to spinal decompression therapy there wasn’t a step between treatments like chiropractic, physical therapy, other non-invasive options and surgery. Now there is. Unlike other structures in your body, discs don’t have a very good blood supply, so once they’re damaged they don’t heal very well. A spinal disc gets its nutrition from the bones above and below it through a pumping motion that increases with movement. But once a disc is damaged or torn, it loses its ability to maintain hydration and becomes dry and brittle. This leads to further damage, inflammation, degeneration and more pain. 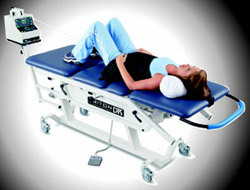 Spinal Decompression enables the doctor to gently, precisely and safely put tension (facilitated by a computer and monitoring device) on the lower back or neck and create a negative pressure inside the disc. This negative pressure creates a vacuum effect that may actually draw the bulging or “slipped” material back into the center of the disc. It can also draw fluids into the disc (known as imbibition), allowing it to rehydrate as much as possible and heal. Unlike other back and neck pain treatments spinal decompression therapy is directed at promoting the maximum possible healing to spinal discs. In a recent study done on previous spinal decompression patients four years after their treatment, researchers found that over 91% continued to be pain free. The spinal decompression system we use in our Calgary office has a high success rate for decreasing or even eliminating pain associated with herniated or bulging discs. It is a non-surgical, computer-controlled traction-type of therapy for the relief or elimination of low back and leg pain or neck and arm pain. During spinal decompression therapy, the injured area is distracted and relaxed at specific intervals, and with proper positioning of the patient and the harness, a spinal disc can be isolated and placed under Negative Pressure, causing a vacuum effect within the disc itself. The sessions are generally very comfortable and relaxing, lasting just 15 minutes on average. How Does Negative Pressure Help a Disc Herniation? During spinal decompression therapy, negative pressure is created within the disc. Because of this negative pressure, disc material that is “herniated”, bulging or protruded can be drawn back into the normal confines of the disc, increasing fluid levels and nutrition to the disc, improving healing and reducing or completely relieving pain. What Conditions can be Effectively Treated with Spinal Decompression? Call our Calgary NW chiropractic office today to book your consultation to see how spinal decompression could work for you.